One of the things that surprised me the most upon moving to LA was the area's independent retail scene. I never really expected there to be so many vibrant little boutiques, selling so many interesting things and attempting to re-define the boundaries of art, fashion, music, commerce, etc. Which is why I was so startled to read in the LA Times last weekend that several of the most pioneering on the scene have recently made the decision to shut down. Iconology, Filly and Lily Savitch have all shut their doors this year, citing the major department stores' shift towards avant-garde fashion offerings (think Barney's Co-Op) - not to mention their ability to offer deep discounts in an economy where people are wary of spending - as a major factor. For anyone here who's at all interested in fashion, this is seriously disheartening news. More so than even local designers, retailers like Iconology et. al. are one of the main reasons why LA has gained so much credibility as a fashion destination over the past several years. Without them, the city wouldn't be much different from any other large, yet uninspiring one across the country. 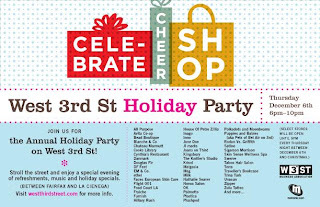 So, with that in mind, I'm hoping that the shops of West 3rd Street get a good turnout for their annual Holiday Shopping Block Party tomorrow night. For those who aren't familiar with the city, West 3rd has perhaps the best concentration of exciting independent boutiques in the city, with shops carrying hard-to-find designers both local and international - and it's no secret that it's by far my favorite place in the city to shop. In an age where holiday shopping has become a bit of a chore for most people, this is a fantastic way to bring fun back into it. Not only will you find really unique things that you can be sure the recipient doesn't already have (and clued-up sales people that aren't 15 years old to point you in the right direction), but there will also be food and bevvies and live music and a lack of soccer moms fighting over the last pair of Old Navy PJs in size medium. I sadly have plans for that evening so can't attend, but will definitely be making my way down to the area next week - and reporting on the great things I find, for those of you who can't make it down tomorrow either.